*The following post is written with the following disclaimer: We at Surebud and its subsidiary Gear Head are fully in favor of raising awareness for breast cancer, or rather raising awareness of breast cancer. Whatever. We are pro-breast. Simple as that. We are anti-awful uniforms. 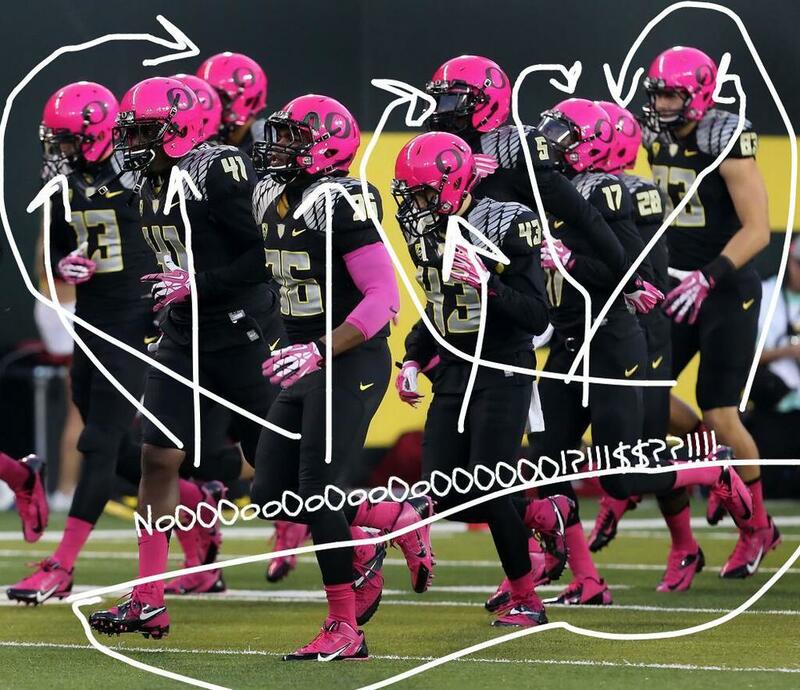 So therefore any comments made regarding the Pink Oregon Visual Crotch Kicking Uniforms is meant merely as a design commentary, not a commentary on breast cancer. We are all for supporting breast cancer. Or rather we are all for supporting breast cancer awareness. Whatever. **These uniforms are awful. We might actually be pro-cancer if it meant we'd never see them again or at least pro lupus or gout. Asterics now given their proper place, DEAR SWEET MOTHER OF ALL THINGS GOOD AND WHOLESOME IN GOD'S GREEN GOODNESS OREGON'S UNIFORMS WERE TERRIBLE. SPITTING, GNASHING OF TEETH, INNER NOSE ZIT PAINFUL. Here you go, a picture that looks like a bizarre remake of Willy Wonka, except where Willy owns a football team instead of a chocolate factory and no, no one wants the golden ticket. Look the jerseys BY THEMSELVES are awful enough, but then to add the helmets, and the socks, and the gloves, and the arm bands, and the shoes. Come on man. Seriously. Hey Oregon, Nike is screwing with you right now. They've put a "kick me" sign on your back, keyed your car, and are preparing a wet willie. Can't you see that? By the way, don't even start to think about prostate cancer awareness. While were at it, nice try NFL. Less that 10% of proceeds from pink NFL gear actually goes to breast cancer related organizations. 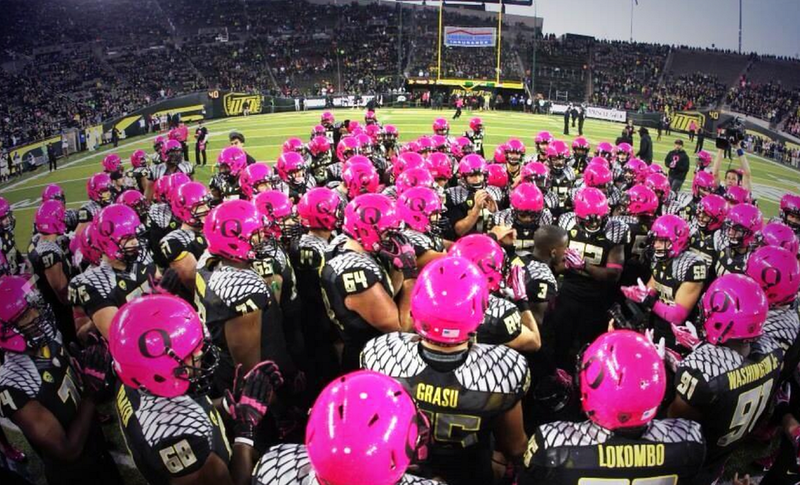 Even if Oregon gave 100% of these things to breast cancer awareness they'd need to make a matching gift to the charity for the blind to balance out. Posted on October 21, 2013 by Sure Bud and filed under Southwest Round-Up, Sports and tagged Gear Head Stop it! Oh No They Didn't!.